You are at:Home»Ireland»Ireland U20»U20 Six Nations»U20 Six Nations Wrap – Who Did What? 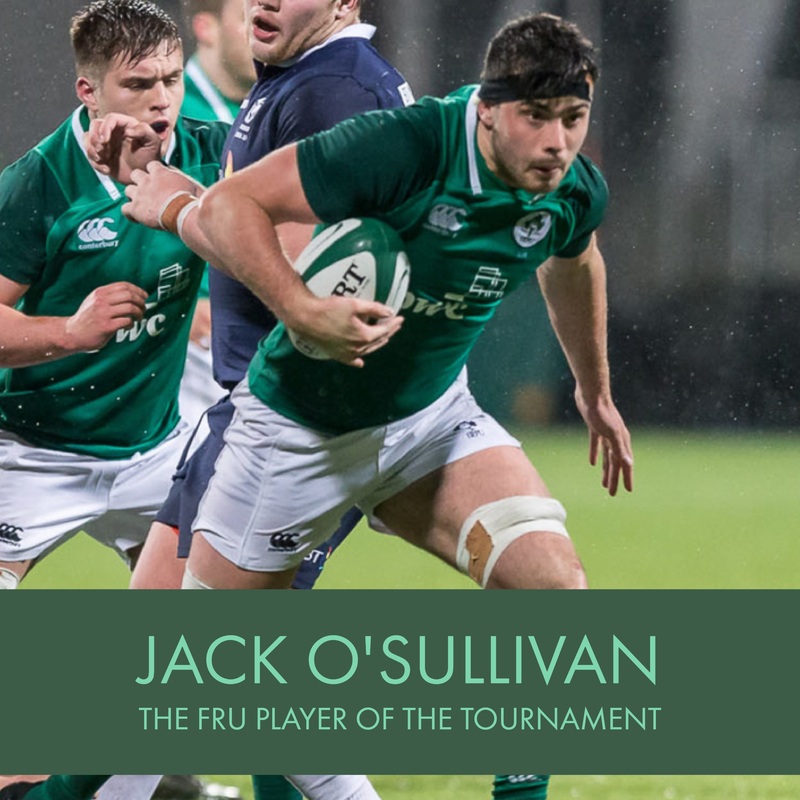 The 2018 U20 Six Nations was one of mixed success for the Ireland U20 side. The team recorded two wins (Italy and Scotland) and three defeats (France, Wales and England) picking up three try bonus points and one losing bonus point in their third place finish. Ireland scored, on average, 4.0 tries per game but their problem was in defence where they conceded, on average, 5.2 tries per game. Ireland had a 75% try conversion rate which was generally more successful than their opponents who averaged a 65% conversion rate against them. There is generally less reliance in the age grade game on penalties but over the series Ireland U20 were successful with an average of 1 penalty per game and conceded on average 1.2 penalties per game. This was always going to be something of a rebuilding tournament behind the scenes for Ireland U20’s. The most successful Ireland U20 coach of recent times, Nigel Carolan, pulled out mid-way through last season’s tournament to take up a senior position at Connacht. Ireland finished that tournament in fourth place, despite winning one more game than this time round, and it was also a season when many key players, Johnny McPhillips, Robert Lyttle, Jack Kelly, Calvin Nash, Jordan Larmour, were in and out of the side due to injuries. An interim coaching team, which included Ulster’s Kieran Campbell, was put in place ahead of that season’s World Championship but the injury toll continued and it was a very young side that struggled to a 9th place finish. It was a big drop from the 2nd place finish in 2016 but there were reasons to be optimistic for 2018 with a series of youngsters blooded and a new coaching team to be announced. Noel McNamara was announced as Head Coach with the exciting prospect of Paul O’Connell as Forwards Coach but there was that bit of typical IRFU fudge with, the unsuccessful Ireland Women’s coach, Tom Tierney also appearing in the management team in some undefined roll. Up until the England game I’d remained resolutely positive about this group but the five tries conceded in the second half took the shine off the tournament as a whole. It was obvious from game two (Italy) that defence needed a lot of work but the pattern was repeated against Wales, Scotland and England and little appears to have been done to address these defensive lapses of concentration. It’s a pity because it is a wonderfully attacking side with huge potential and some great players. Unfortunately the magnitude of the defeat by England has put some question marks against the quality of the coaching. However, I’ve said throughout the competition that, the U20 Six Nations give the coaches a chance to assess their armoury ahead of the U20 World Championships, which is the premier annual competition at this level. With that in mind we’ll reserve judgement on the new set of coaches until after the world Championships in June. The coaches had a look at 33 players in the tournament with just under half of the squad, 16 players, from Leinster. Of course all squads are dominated by Leinster players these days but the big surprise this time round was that Ulster representation came second with 10 players involved. Munster had 6 players called up and Connacht only one. 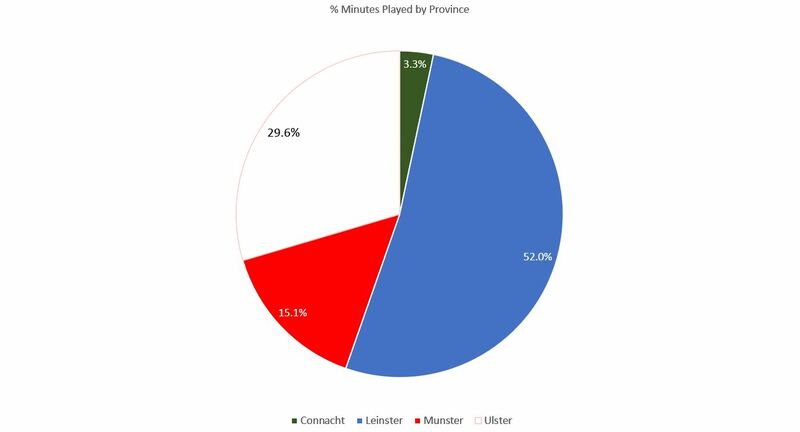 Of course, the real measure is how the players were used and going by minutes played by each Province’s players, over the five games, the breakdown is as follows. Click to view in fullscreen mode. I’d guess Munster and Connacht are pretty disappointed with their representation. In terms of individual players only five started every game; Michael Silvester (Fullback), Tommy O’Brien (Centre and Wing), Jack O’Sullivan (Number 8), Jack Dunne (Second row) and Harry Byrne (Outhalf). Unsurprisingly, these five come in as the top five with regards to minutes played though, with the exception of O’Sullivan, I’d have liked to have seen a few more options looked at, particularly at outhalf. 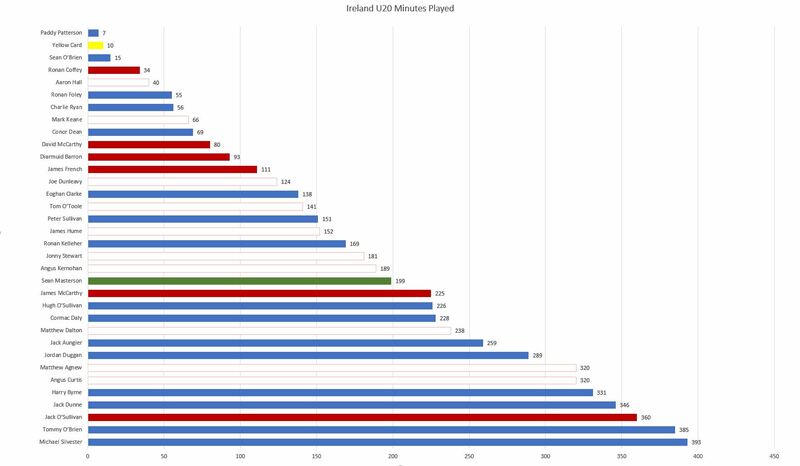 Angus Curtis and Matthew Agnew are the top two Ulster players in terms of minutes played. I regarded both as the standout Ulster players and both played the entire 80 minutes of each of the four games they started. Curtis, to me, was the stand out player of the tournament and I’d have loved to have seen him play out half and I’m somewhat surprised this didn’t happen. Points, don’t necessarily, mean prizes. As we said at the start, this was a team that didn’t have a problem scoring points, unfortunately they also gave quite a few away. They scored an average of 29 points per game but gave away just over 36 and the failure to address the defensive lapses was the major issue of the tournament. The leading point scorer was, unsurprisingly, Harry Byrne who had a good tournament with the boot, the top try scorer was No. 8 Jack O’Sullivan. The forwards chipped in with 9 tries (including a penalty try) over the series with the backs contributing with 11 tries. Ulster players Jonny Stewart (2), Angus Curtis, James Hume, Matthew Agnew and Matthew Dalton all crossed during the series. If past seasons are anything to go by, there will be the odd flyer to come in and some provinces, most likely Ulster, will withdraw players. However based on the stats from this tournament the most likely team to start for Ireland against hosts France on the 30th of May is as follows. Silvester only missed 7 minutes the whole tournament and is the only player to be used at full back. Has pushed on well fro last season. No clear cut decision here with 4 players starting on the right wing throughout the tournament, including team captain Tommy O’Brien. Assuming O’Brien is more likely to be used at centre the other two contenders, alongside Kernohan, appear to be Peter Sullivan (151) and James Hume (152). Sullivan played all his minutes on the right wing, Kernohan swapped between both wings and Hume swapped between centre and wing, Kernohan getting the nod in that he had the most minutes on the pitch. Started on the wing and inside centre was well as clocking up 230 minutes outside Angus Curtis. Sat on the bench for the France game before making inside centre his own in the subsequent matches. Would have liked to have seen him get a run at out half. A star in the making. Burst onto the scene with three tries in two games but dropped out of the picture after the Wales defeat. Angus Kernohan (189) and Mark Keane (66) covered the position in the next two matches but McCarthy appears to be back firing on all cylinders for the U19. Started at out half for every game and Paul Deane (69) was the only replacement used so it appears that the coaching team have made their decisions on this one. In fairness Byrne was very solid in the position and was generally excellent off the tee. Hugh O’Sullivan (226) and Jonny Stewart (181) shared the scrum half berth with Stewart’s campaign disrupted by selection for the Ulster senior side mid tournament. Jordan Duggan and James French (111) were the only options at loose head with Duggan starting four of the games. Solid. Tournament blighted by injury but Kelleher showed enough to confirm he’s the real deal. Eoghan Clarke (138) and Diarmuid Barron (93) deputised well. One of our players of the tournament, Aungier was impressive throughout. His replacement Tom O’Toole (141) wasn’t far behind. Real strength here. Dalton just gets the nod ahead of Cormac Daly (228) who started three times in second row with Dalton starting the last two plus one at wing forward. Dalton was also pulled into the Ulster Senior squad mid tournament. The abrasive Ulsterman should get the call for the World Championship, if available. The only contender, started all five games and only missed significant game time after picking up a knock against Wales where Charlie Ryan (56) deputised. Picked up a few knocks throughout the tournament which gave Joe Dunleavy (124) an opportunity which he took with both hands. Dalton also played a full game at blindside. Good competition here. Our find of the tournament. Agnew got his chance after an injury to Aaron Hall (40) against France. Grew into the tournament with some eye catching displays. Only player to start at No. 8 and quite the player at that. Ronan Foley (55) deputised for 40 minutes against Italy but a lot of this tournament was the O’Sullivan and Curtis show. Just pips Diarmuid Barron (93) by virtue of game time. Charlie Ryan (56) and Ronan Coffey (34) also tried here but Daly will be pushing hard for inclusion in the starting XV. Competitive back row with Aaron Hall (40), Ronan Foley (55) both likely to be in the mix. However Dunleavy will be pushing for a starting berth. If Stewart is released for the tournament I suspect he’ll start. If not Paddy Patterson (7) was the only other scrum half option looked at outside of the two main contenders. Got surprisingly little game time as Byrne dominated the out half choice. I would have preferred more experimentation in this position. David McCarthy (80) and James Hume (152) may also be considered here as centre replacements. Peter Sullivan (151), Mark Keane (66) and Sean O’Brien (15) are the other contenders with Hume and Sullivan realistically pushing for a starting berth. Hume’s ability to cover from out half to full back may see him destined for a bench spot! The Front Row Union Irish Player of the Tournament. There were three main contenders for player of the tournament with Angus Curtis, Jack O’Sullivan and Jack Aungier all bringing something above and beyond their positional demands. However, the biggest influence on the team as a whole came from Jack O’Sullivan who picks up out Player of the Tournament award.